French-owned Dalian ODC Marine, based in Dalian, China, has completed a new Bureau Veritas-classed passenger vessel for service in Corsica, France, designed by Laurent Fourré. To be operated by Viamare, UK, the aluminium vessel has an overall length of 18.3 metres on a 4.6-metre beam and 1.42-metre depth. ‘U Portu’ has a displacement of 25 tonnes and is powered by a pair of Cummins QSL9405MCD main engines and twin ZF35-1A 2.417:1 ratio reduction gearboxes. The vessel has a total fuel capacity of 1,600 litres and a freshwater capacity of 200 litres. Fuel consumption is rated at 60 litres per engine per hour. On board, the vessel is fitted out with a Danforth-supplied compass as well as a variety of navigation and communications electronics by Furuno and Navman – radar, depth sounder, GPS and plotters were all supplied by Navman while Furuno supplied the radios, AIS and GMDSS. The distinctive, parrot-hued vessel has Birmani teak, Russian willow and cherry tree interior furnishings. The vessel’s adequate safety equipment includes seven lifebuoys and two CMS HSC 2000 liferafts, each for 50 people. There are also 110 life jackets and 110 flashing lights. Carrying a maximum of 97 passengers and two crewmembers, the vessel has a top speed of 22 knots and a cruising speed of 20 knots. 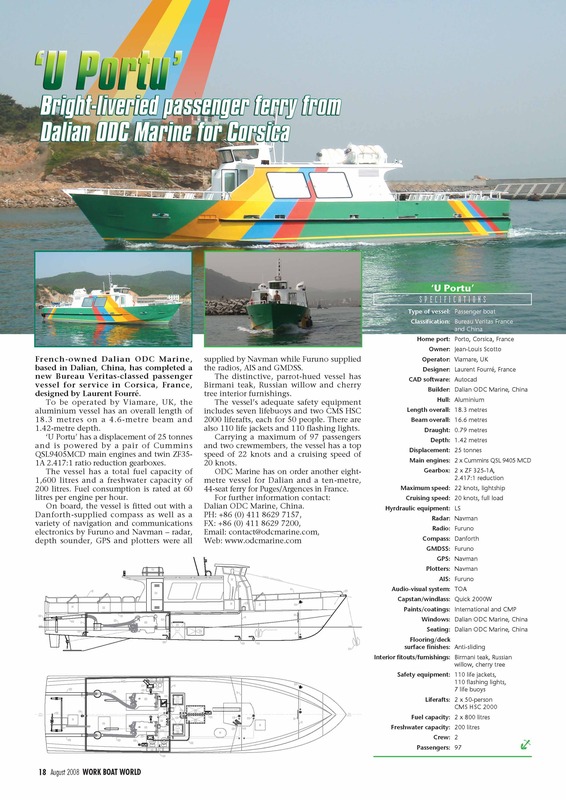 ODC Marine has on order another eight-metre vessel for Dalian and a ten-metre, 44-seat ferry for Puges/Argences in France.